Within a statistics provider, for example CC or WTM, Awesome Miner handle the concept of no exchange. Awesome Miner do find the coin on CC in this case, and CC has highest priority, it will currently not even look at the same coin if provided by WTM or CTM. The result is that even if what CC provides doesn't match the volume filter, Awesome Miner will not look at the additional exchanges at CTM. Each provider is processed individually and coins already found will be ignored if found again. I understand you point here, but I will have to redesign a few concepts before the scenario you describe can be supported. Thanks for the feedback on this! When configuring like @baf28 suggested, Awesome Miner should produce a command line similar to what you are looking for. You can use the Diagnostics button to verify that. 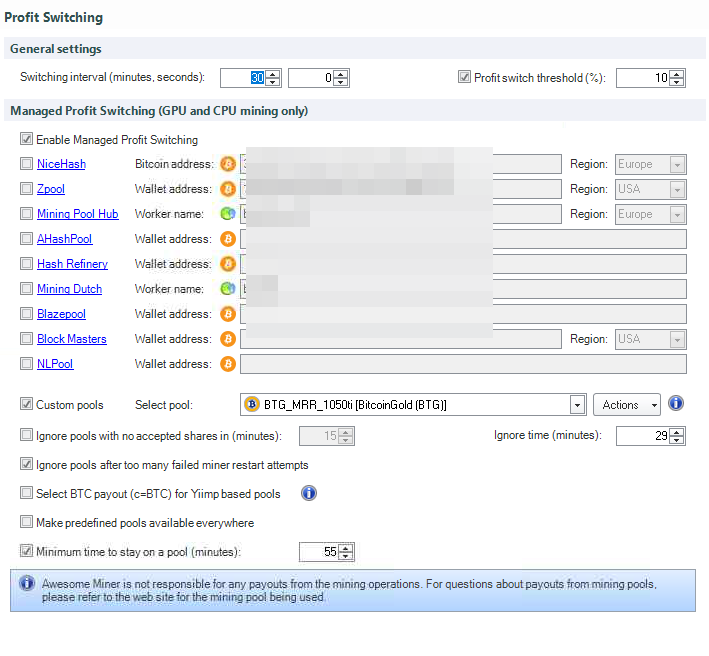 hi patrike, for tensority cant see dual mining hashrate... how i can setup dual mining eth-btm? perfect thank you very much, sometimes we do not remember all the options. I fixed it, so I'm grateful. For Bminer I've noticed that I get 0 for both hashrates every now and then for both the primary and dual hashrate. But I do get two readings most of the time. Can you send a screenshot and an API report (toolbar: Tools -> API Report) when you see this issue? Thanks! nbminer dual mining is not integrated? This is a bad decision. it was better to make calculators stick to the same algorithm or rewrite through the settings to the required algorithm. Thanks for sharing the details. Awesome Miner doesn't support dual mining for NBminer yet. It's on the ToDo-list. Maybe another way would be to have Awesome Miner automatically change this on a per-coin level instead. The drawback would be that as soon as a new coin shows up on any of these algorithms, the mapping would be outdated. Doing it on an algorithm level is easier from that point of view. It's however not a good idea to force all users to manually go to the settings and change the algorithms for a number of coins just because they are reported differently from the coin statistics sources. The goal must always be that things should work as good as possible out-of-the-box. When I select the mrr pool in the switch profile, an error occurs that the pool is not suitable. And if you choose not mrr, then everything works. I assume this might've happen with any managed software in similar to above circumstances. Can you please send me the log files for this scenario and indicate what time you run into the problem? Your observations are correct for NBMiner, where the issue is that no algorithms where enabled by default. I will correct this. The only scenario I was able to reproduce where no pools showed up for the profit switcher was when NBMiner was the only software made available for the profit switcher or when no other combination of enabled software and algorithm was found. If I put NBMiner in the list of available software, and also have other software and algorithms available, the profit switcher would go for one of the other software as it considered NBMiner to be not usable. Even if I'm not able to reproduce the exact same issue here, the correction should still make sense here.